Speaking from New Zealand head coach, Noel Wagapu, says that the boys have settled in well in their residence at Kings College and have had a few training sessions which has helped them acclimatise. “Arriving 4 days before the championship has been an advantage for us because it is a little bit cold here but the boys have settled down and we are looking forward to our first game,” Wagapu says. With only 3 teams in their pool the Mamulas have only 2 matches to prove their worth so each game will be crucial as a loss may mean that they are knocked out of the competition and this is a thought not lost on Wagapu who says that his boys will be giving 100 per cent to get the right results. “It will not come to us easy but this is what we are here for. We want to win all our games starting from our first one. All our hard work from the last 7 months will be tested and we want the results to come our way,” Wagapu says. The New Caledonia side has also been working hard under coach Stéphane Drahusak and will not be handing anything to the Mamulas on a platter as they look to improve their record against Solomon Islands in the age-group level. The Mamulas have been rated as favourites going into the match against New Caledonia with the Wagapu coached drawing confidence from the national league experience of several of the players in the team. One such player is Dennis Ifunaoa who has proved lethal six times against local sides in the Telekom S-League and his confidence to go for goal will be a vital asset for the team and he will be strongly supported by 17 year old Tutizama Tanito who had his international debut with Marist in the 2009/10 O-League season. The combination of this duo has been effective in their locally held friendly matches but this is the first time for it to be tried on the international stage and a lot of expectation will be weighing on their young shoulders. The Mamulas backline has good height and will be strong against crosses at home but also be effective targets for headers up at the front with most of the players also having national league experience at the least with several being regular starters for their clubs including captain Michael Sira and Michael Boso. The midfield zone is surely in the hands of Leonard Rokoto who locally plies his trade with Western United and at one time with Koloale and his duties will be much needed in the centre against New Caledonia. All in all the game plan for Wagapu will be to keep New Caledonia from having any shooting chances and crosses into the penalty while at the front ensure that Ifunaoa and Tanito are well supplied through Himson Teleda on the left and Toata Tigi on the right. Morale in the Mamula camp remains very high after having received a strong statement of support from football supporters before their departure on Sunday. The team received training and travel wear from Our Telekom and new apparel print company Design Rite as well as from Members of Parliament, Hon. Bradley Tovosia and Hon. Jimmy Lusibaea whose donation was presented by his wife, Vika Lusibaea. The items were handed over to the team during their farewell dinner in which several guests including the Solomon Islands Football Federation (SIFF) President, Martin Alufurai, offered their best wishes to the team. “You are the top players in Solomon Islands in your age category and I want you to know that I am confident that you can do well for your country,” Alufurai said. 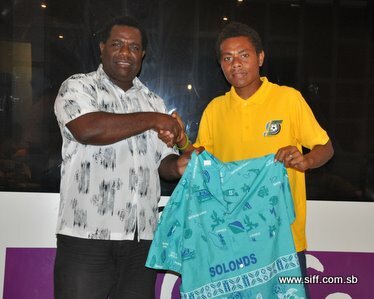 A long time supporter of football and former executive member of SIFF, William Lai, also shared words of encouragement with the players saying that the current crop of players is the most privileged youth team ever to represent Solomon Islands. “Players like Gideon Omokirio and Henry Fa’arodo never had the national soccer league but you boys are fortunate because you have the opportunity to play in the Telekom S-League. This experience will be important for you when you play overseas,” Lai said to the players.